The tea aficionado ruler – the Han Dynasty Emperor Jing Di – died in 141 BC, making the leaves 2,150 years old. Archaeologists have discovered the oldest tea in the world among the treasures buried with a Chinese emperor. New scientific evidence suggests that ancient Chinese royals were partial to a cuppa – at least 2150 years ago. Indeed, they seem to have liked it so much that they insisted on being buried with it – so they could enjoy a cup of char in the next world. Previously, no tea of that antiquity had ever been found – although a single ancient Chinese text from a hundred years later claimed that China was by then exporting tea leaves to Tibet. The new discovery was made by researchers from the Chinese Academy of Sciences. By examining tiny crystals trapped between hairs on the surface of the leaves and by using mass spectrometry, they were able to work out that the leaves, buried with a mid second century BC Chinese emperor, were actually tea. The scientific analysis of the food and other offerings in the Emperor’s tomb complex have also revealed that, as well as tea, he was determined to take millet, rice and chenopod with him to the next life. The tea aficionado ruler – the Han Dynasty Emperor Jing Di – died in 141 BC, so the tea dates from around that year. Buried in a wooden box, it was among a huge number of items interred in a series of pits around the Emperor’s tomb complex for his use in the next world. Other items included weapons, pottery figurines, an ‘army’ of ceramic animals and several real full size chariots complete with their horses. 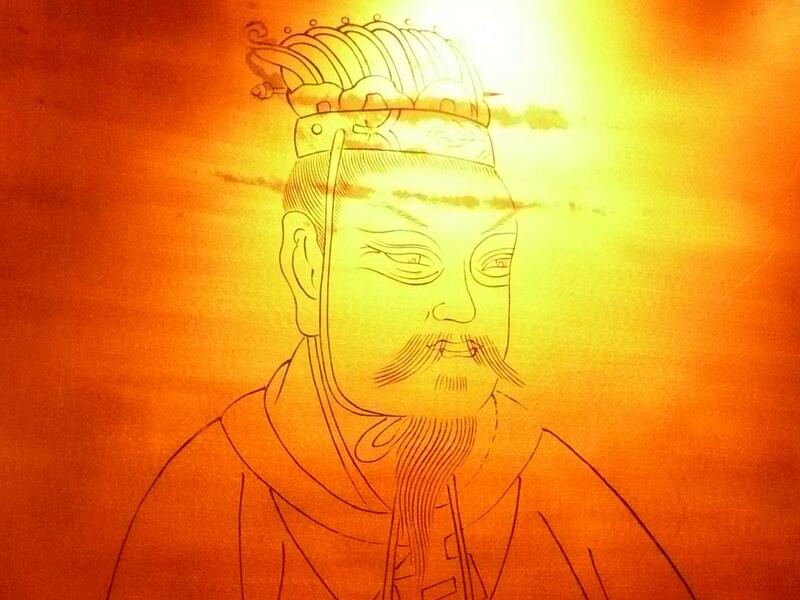 The tomb, located near the Emperor Jing Di’s capital Chang’an (modern Xian), can now be visited. Although the site was excavated back in the 1990s, it is only now that scientific examination of the organic finds has identified the tea leaves. The tea-drinking emperor himself was an important figure in early Chinese history. Often buffeted by intrigue and treachery, he was nevertheless an unusually enlightened and liberal ruler. He was determined to give his people a better standard of living and therefore massively reduced their tax burden. He also ordered that criminals should be treated more humanely – and that sentences should be reduced. What’s more, he successfully reduced the power of the aristocracy. “The discovery shows how modern science can reveal important previously unknown details about ancient Chinese culture. The identification of the tea found in the emperor’s tomb complex gives us a rare glimpse into very ancient traditions which shed light on the origins of one of the world’s favourite beverages,” said Professor Dorian Fuller, Director of the International Centre for Chinese Heritage and Archaeology, based in UCL, London. The research has just been published in Nature’s online open access journal Scientific Reports. The tea discovered in the Emperor’s tomb seems to have been of the finest quality, consisting solely of tea buds – the small unopened leaves of the tea plant, usually considered to be of superior quality to ordinary tea leaves. White tea, in the past 3 years, saw a renewed interest by Chinese tea drinkers. A few tea shops I patronized, told me that their white tea, especially the older ones were snapped up by tea drinkers and collectors. Old white tea, if stored well, has a mellow and aromatic scent. White tea sounds delicate, but do not underestimate this tea. My mother complained she was wide awake at midnight (I did not tell her she had white tea in the evenings on 2 separate occasions) and had to watch TV for a while before she turned in for the night. This 250g white tea cake is produced in Fujian China by Kanglaiyan tea factory. I had purchased this cake in 2010 and had decided to open it up last month. You will have noticed that this tea cake is composed of quite a number of larger leaves (thumb size). This white tea, when brewed, is aromatic, like a bouquet of fresh flowers and dried herbs. The aftertaste is sweet. 10g of this tea can easily brew up a liter of tea that pairs well with a Chinese dinner. On my way home from Canada, I stopped for a day in Hong Kong. This 1 day layover allowed me to adjust my internal time clocks and most importantly, gave me the opportunity to drink as much tea as I could, as brewing tea in the Canadian hotels was not good. Let me explain, the Canadian hotels were great in terms of quality, hospitality and service…..except that you could only get hot water from the room's coffee maker. Getting boiling water from these machines will have that inevitable coffee aroma in the water. I lost count how many times I had to discard the hot water before I brewed up a cup of tea. I drank lots of tea during this layover……and I even bought some tea ware. 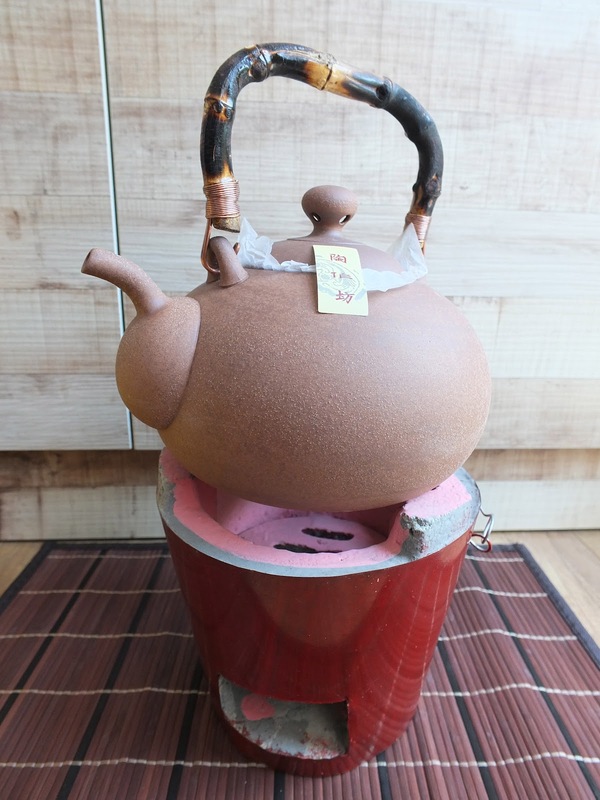 One was this Lin Ceramics Kettle. This 1.4l kettle looks very traditional. Noticed the bamboo handle that was carefully bent and the fine copper wires wrapped at the handle ends nicely 'hooking' onto the pot. Overall impressions of this kettle is good. Apologize for the different light exposures of the pictures. The color of the kettle is closer to pix 2. I read the enclosed instruction leaflet that I had to boil or cook rice porridge in the kettle for the 1st use. This was to ensure the 'waterproofing' of the kettle so a user will not get dampness on the exterior of the kettle while in use. This 'cooking of rice' in ceramic pots and kitchen ware is a very traditional method to prepare such pots for use. In Japan, locals there also cooked rice in their new earthenware pots (aka donabe) before actually using them too. What is the science in such methods? I do not know, but I am going to boil porridge in my kettle soon. My daughters think I am off my rockers. And why buy a ceramic kettle? Many tea drinkers tell me that using boiled water from these earthenware taste sweeter. I cannot comment unless I actually try it out for myself. 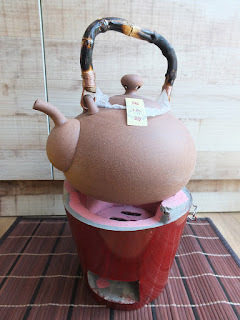 This coming Chinese New Year long break will provide me that opportunity to compare how the water taste like, and allow me to compare with my Japanese tetsubin I bought last year and my regular steel kettle that I regularly use to boil water for my tea. I had also purchased a small teapot at one of the teashops in Hong Kong. This is a 80s single hole teapot. The color and the overall appearance of the teapot appealed to me and this teapot is now being used by me for oolongs due to its smaller size (about 130ml). As for that stove in pix 4, I found this traditional stove in a small grocery store last weekend. Notice the red metal sheet that 'wraps' neatly around the stove. Perhaps…. I should get some smokeless charcoal and used it for my kettles. I did my undergraduate studies in Manitoba, Canada many many years ago and it was a real treat to be visiting Canada during the Christmas week last year. I never liked long flights and it took about 40 hours of flight time to get to Canada and back. I am still in zombie land as I post this entry. I was told that last Christmas was one of the warmest on record and I took advantage of the 'warmth' to visit Niagara Falls while in Toronto. I was quickly reminded of the harsh Canadian winter when I arrived in Montreal on boxing day. Yes, the great sale was on and the Montreal shoppers turned out in full force despite the cold to purchase discounted goods. Nonetheless, I managed to find my way in the cold to visit the magnificent Notre Dame and attended mass on Sunday morning. Back to tea…..I had no time to visit tea shops in Canada and could only visit Toronto's Chinatown for one afternoon. There was a dim sum place called Sky Dragon Restaurant that had good Cantonese Dim Sum served with a choice of Chinese tea (pu erh, oolong or white tea). Not the best but I loved it. The food choices was presented on push carts and you actually order from these carts. It was an inexpensive meal, costing less than $25 for 7 dim sum choices and tea. I highlighted the price as I had a similar meal in Hong Kong on my way home from Canada with similar settings and food quality but paying twice as much. While wandering around Toronto Chinatown, I came across a Chinese store selling Chinese kitchenware that was selling the gaiwan in the 1st pix. This rice pattern porcelain Gaiwan is made in the 90s in the famous Jingdezhen, China. Though 6 gaiwans were available, I had to buy only one due to limited luggage space. I only paid $4 for the gaiwan. I also found a ripe pu erh cake for sale in a grocery shop while in Chinatown. But I digress. I would like to thank Hector Konomi and his wife for inviting me to their house in Toronto for dinner and a long session of Chinese tea. I appreciate the warm hospitality which made the occasion a memorable evening. Hector is very passionate about Chinese tea, displaying good knowledge and tea brewing techniques while we had tea. Thank you Hector.